Make your own homemade cream cheese wontons. Combine cream cheese, sugar, and grated while onion. Stir together the cream cheese mixture until it is well blended. Prepare an egg wash by combining one egg and water in a small bowl. To fill wontons with cream cheese mixture, brush egg wash on two sides of the wonton wrapper. Drop about a teaspoon of cream cheese onto the wonton wrapper. There are many ways to close the wonton wrapper. Wet the sides of the wrapper with the egg wash. Lift up the middle of the 2 opposite sides so that they meet. Squeeze lightly together Bring the middle of the 2 other sides to close the wonton Gently squeeze to close the wonton. The wonton will remain slightly open. Add enough oil for frying into a pot to cover the bottom 4 inches of the pot. Heat the oil to 350 degrees. 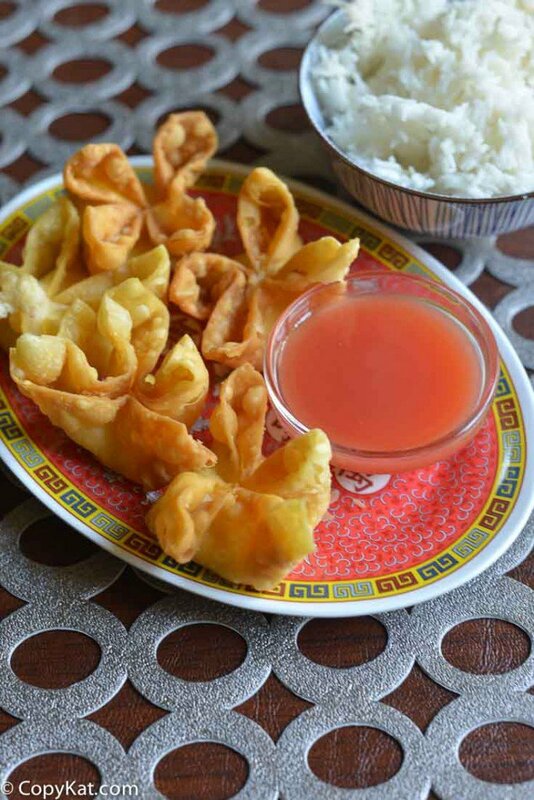 Drop the wontons in a couple at a time until they are golden brown. Drain on a wire rack or on paper towels. Serve immediately.